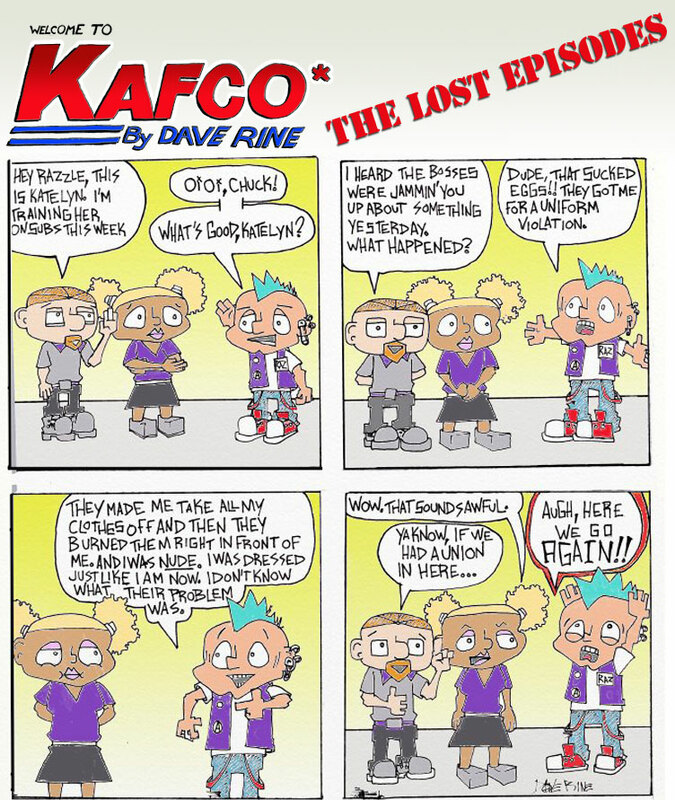 The “Lost” Welcome to Kafco strips. When I first started drawing Welcome to Kafco strips for Global Revolution Comix, I was preoccupied with drawing the artwork for my upcoming graphic novel on labor history. So I forgot to send these two strips over to Chris McCamic at Global Revolution and, when he launched the site, he ran the third strip I had drawn as “Episode 1,” because it was the first one I sent him. So, for all the Kafco fans out there, I present the original two Welcome to Kafco comic strips! The next strip introduces the character Razzle, an homage to the character played by Flea from the Red Hot Chili Peppers in the cult classic punk rock movie Suburbia by Penelope Spheeris, and introduces the idea that Chuckie is trying, very unsuccessfully, to form a union at Kafco, which will become more important as the strip develops.